Terrarium Labs announces the successful certification of their Stacker NAND technology which triples the capacity of existing flash memory technologies. As an IP R&D company based in the China West Technology Park, Terrarium Labs has been focused on developing compression technology to massively expand flash storage capacity. 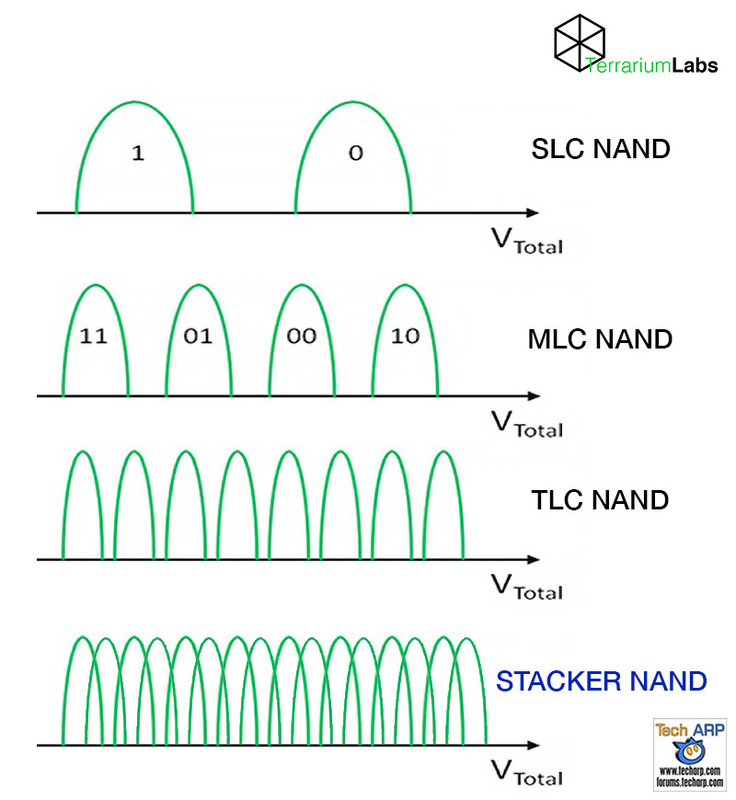 Unlike existing MLC and TLC NAND technologies, Stacker NAND works independently of NAND process technologies. In fact, it is applied to existing NAND flash technologies to triple their capacities. The Stacker NAND technology uses two different compression methods to deliver TRIPLE the capacity of any existing NAND flash storage technology. The first is a lossless data compression algorithm that compresses data before they are written to the NAND flash memory. Depending on the file type, this can almost double the amount of data that can be stored in a particular flash chip. To further increase the storage capacity to 3X, they add a lossy compression technology which applies filters that reduces the randomness of the data. This allows the earlier lossless compression technology to be even more effective. At the moment, Terrarium says 3X more storage is a good compromise between additional storage and loss of data. But if necessary, they can scale it up to 5X or even 6X. As you can tell, the Stacker NAND technology cannot be used for regular data. It is designed to be used only for photos and videos. Terrarium Labs was very explicit that their compression technology will change some data in return for much small file sizes when compressed. However, they see this as a small price to pay for much larger storage capacities at the same price. According to Terrarium Labs, a 256 Gbit Stacker NAND module paired with a regular 256 Gbit NAND module will double the effective capacity for very little cost – 768 Gbit of lossy storage + 256 Gbit of lossless storage. Below is a prototype M.2 SSD module they created out of one regular 256 Gbit NAND module and two 256 Gbit Stacker NAND modules for 2.33X the effective storage capacity – 1,792 Gbits of storage, instead of just 768 Gbits. That’s just over 1,000 Gbits of extra storage! Although Terrarium Labs admits that their lossy compression algorithm will reduce image quality, they say that at 3X, this is minimal and will only be obvious if the pictures or videos are examined very closely. They also pointed out that some of the filters used will actually reduce noise, which enhances picture and video quality. Obviously, we found that hard to believe, so they invited us to send them some photo samples. We sent them a dozen photo samples from the ASUS ZenPad 7.0 and the recently-reviewed honor 5X smartphone. Take a look at the four comparisons of their lossy compression filters at work. They are correct that the difference is subtle and only apparent up close. There is some loss of detail, but also less noise. But would you accept such changes? Terrarium partners can pair the Terrarium Stacker processor with any number of NAND modules, and choose either lossless or lossy compression, or both. Terrarium is also offering the compression software to partners who prefer to do without the processor, but it may sap up to 30% of a quad-core processor’s cycles. They claim they’re currently in talks with the top smartphone manufacturers from the United States, Korea and China to introduce the Stacker processor and/or software into the next-generation smartphones. Tech old-timers will remember Stacker, the disk compression utility for MS-DOS. It not only doubled the capacity of our puny 42 MB hard disk drives, it also sped up reads and writes by compressing data before they were written to the abysmally-slow hard disk drives of the day. However, Stac Electronics, the company that developed Stacker soon crumbled after Microsoft introduced their free DoubleSpace disk compression software. Little known to many, Stac Electronics spun off a chip making company called Hifn, which makes encryption and compression processors. Some of Hifn’s key engineers are those who helped form Terrarium Labs. That’s why they named their first product – Stacker.